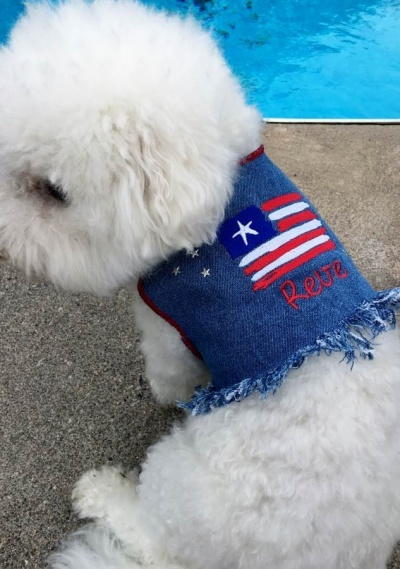 Every dog needs a denim vest for the patriotic holidays. Celebrate your next patriotic holiday by dressing your dog in this cute dog fringe denim outfit. We also make a matching dress for a His & Her set. A beautiful whimsical American flag accents the back of the vest and your pet’s name is FREE on the garment or you could order it blank without the name. A finished border has been added to the garment on the upper portions, while tufts of fringe accent the hem line. It’s the today’s hottest fashion trend that every dog needs in their wardrobe. 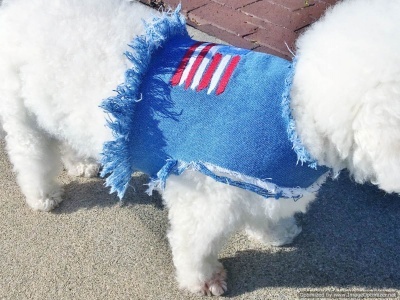 We’ve totally destroyed this patriotic denim vest for your bad-to-the-bone-dog. Celebrate your next holiday by dressing your cool dog in this cute dog fringe denim outfit. 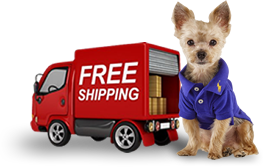 A beautiful whimsical American flag accents the back and your pet’s name is FREE on the garment so that people can greet him by his name, or you could order it blank without the name. Tufts of fringe and shiny metal stars have been added to the entire garment. Look mean, rough and lovable with this denim jacket vest. The street look is today’s hottest fashion trend that every dog needs in their wardrobe.